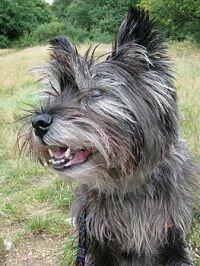 The Cairn Terrier Dogs are assumed as one of the subcategories of Scotland's terriers along with the Westies (West Highland White Terrier) and the Scottish, The Westies and the Cairns are highly related. For one, Westies are hybrids of white dogs crossed with Cairns of western Scotland. The Westie can be considered as the white variety of the Cairn who has a coat of any color but white. Scotties, however, have longer heads and bodies, have generally dark coats and are aloof than the other two. These dogs originated from the short-haired Skyes. Cairn is the smallest breed among the terrier group. The name Cairn was coined after the small stone piles that marked borders of Scottish farms and graves. During the early times, this breed was used to guide small animals into these piles of stones. However, cairns are strong and sturdy but are not heavy. This dog was already present during the 1500s even before it became popular in 1930, after the appearance of "Toto" in "The Wizard of Oz" as Dorothy's companion dog. Presently, like the American pit bull terriers, Cairns are used as companion dogs. Among the variety's talents are tracking, watching over the house, hunting, and performing tricks and sports regarding competitive obedience. - Daily brushing is recommended to prevent tangles and mats. - Hair around ears and eyes must be trimmed regularly. - Do not over feed them as they gain weight easily. - Their physique requires a regular exercise routine which includes a daily play time while on leash. - They should be on leash while walking in public places because of their hunting instincts. As already noted, the Cairns were existent since around the 1500s. At around 1700s, the Isle of Skye and other highlands in Scotland were already producing lots of small terriers. Scottish breeds were separated into two: the Skye terriers and the Dandie Dinmont terriers. In the year 1912, the Cairns receive their official name based on their excellent ability to hunt down vermin such as otters, foxes, and badgers that were hiding in cairns. However, it was in the year 1913 when they received the official recognition from the American Kennel Club. 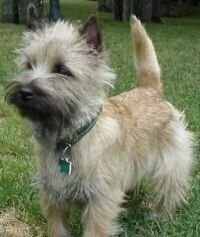 The Cairn terrier is one heck of an agile little dog that is very appropriate for the whole family. This breed is playful, prying, and is always ready to join the fun. If you are still not convinced, just reckon how Dorothy was entertained and accompanied by this type of dog.